Happy Fur-iday! And when it’s Fur-iday you know one of the Tribe of Five will be opining on Friendly Fill Ins. We couldn’t decide who would get to answer the fill ins so Olilver, Lily and I are all opining this week. 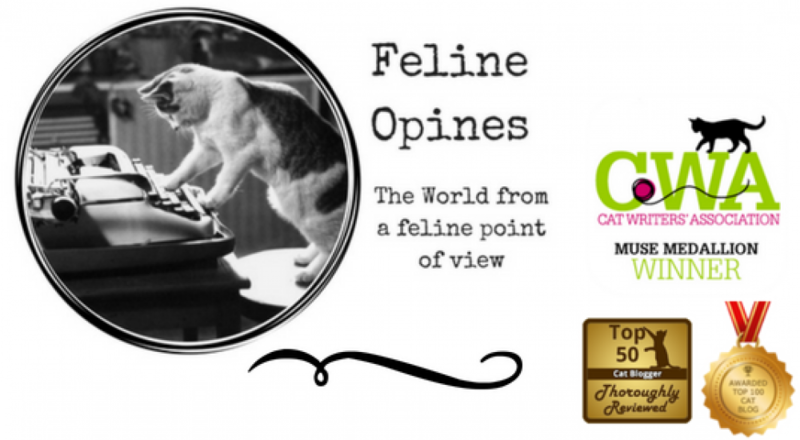 This is a blog hop hosted by our furiends from 15andMeowing and Four-Legged Furballs. You can hop on over to their sites and join the fun or, if you prefer, you can opine in our comment form. 1. Lily: I have no patience for felines who are not well-read. The Caticons book is fantastic and we’re reading a new book we’ll be reviewing soon called Prancie’s Prayer. 2.Alberto: Being interrupted in the middle of my favorite TV show makes me cranky! 3. Oliver: I’m surprised that giving The Female Human my saddest face has no affect on her when she sits at the counter having breakfast. 4. Oliver: To make a long story short, I underestimated my girth when I squeezed under the kitchen stool.